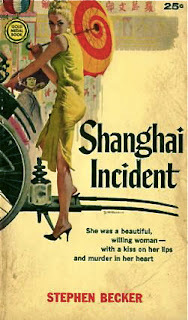 Maybe I’m a sucker for all things Shanghai – Paris of the East; hotbead of intrigue, and so on. I’m especially fond of those old movies with the city‘s name in their title – Lady from Shanghai, Shanghai Express, Shanghai Gesture. The (Eurasian?) 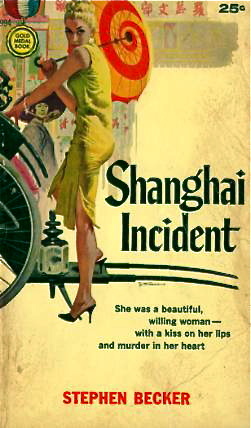 woman depicted on the front cover of Shanghai Incident is obviously the story’s femme fatale, and I just love the yellow dress, orange umbrella and high heels. By the way, I’m curious to know what those Chinese characters say at the top. And the Chinese woman in the background – is her gaze directed at the woman in yellow or beyond her, out towards the viewer? I’ve always thought that the Gold Medal line of paperback books in the 1950s were among the best produced and had some of the coolest covers. This stunning design by cover art legend Robert McGinnis typifies the company’s bright, splashy style. 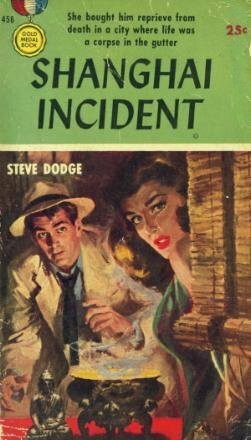 I’m most familiar with his work for Dell, especially the series for the Mike Shayne novels, and is it my imagination, or did he change his style a bit for the GM covers? In any case, McGinnis, with Barye Phillips and Robert Maguire, probably did the best portraits of dangerous, seductive women which adorned the covers of so many paperbacks in the vintage era.